From annelids, which include earthworms, there are no special authorities that are responsible for breathing. Gas exchange happens by diffusion of the whole body, that is, they are "breathing skin". Respiratory worms is not necessary, since the ring structure and the cylindrical form provides the optimal ratio of volume and surface area involved in the production of oxygen. Given that worms are quite little move, we can say that breathing through the skin they have enough. 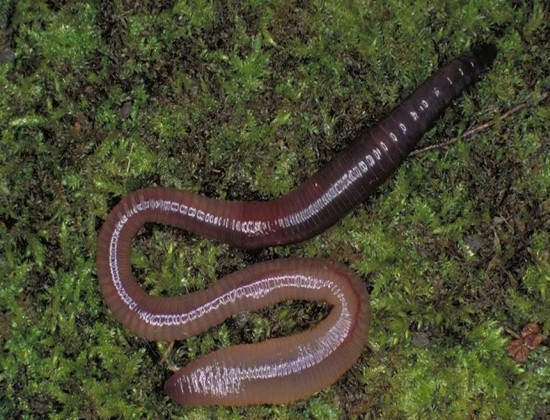 However, worms have a circulatory system, in contrast to single-celled organisms and some species of insects in the blood of earthworm is dissolved hemoglobin, which is carried through the body by cutting major blood vessels in the movement of the worm. It distributes oxygen throughout the body, helps to maintain diffusion. Large vessels is one vein and one artery, so the blood vessels have worm (except for the capillaries, located under the cuticle). As such, the skin, as in mammals, earthworm, in principle, no, there is a very thin covering of cuticle. This skin is moistened with epithelial secret, and due to its minimal thickness allows the worm to breathe. However, drying of this skin is not protected, because worms must live in a moist environment, in order to protect the skin from drying out. The oxygen previously dissolved in the water, which covers the body of the worm, and then absorbed into the blood through the capillaries. If the skin of the worm dries up, he can't get from ambient oxygen and dies. As the earthworm goes to the surface, this system of breathing is very favorable to it – it can take for gas exchange oxygen directly from the soil. Between the particles of the earth is sufficient oxygen to provide them with the worm. During rain, the worms crawl out of the earth to the surface, this is due to the fact that the water glues the particles of the earth, and between them no air. To obtain the necessary oxygen, the worms should rise to the surface. To check the respiration of the earthworm, you can conduct a simple experiment: a jar is filled with earth, the top is placed a few worms. After a short time the worms will bury in the ground, but if you water the ground water, they rise to the surface. Similarly breathe all annelid worms with leather the whole surface of the body.